Show that we can all work together to find the missing puzzle piece to autism when you show your support for a loved one battling with this condition. 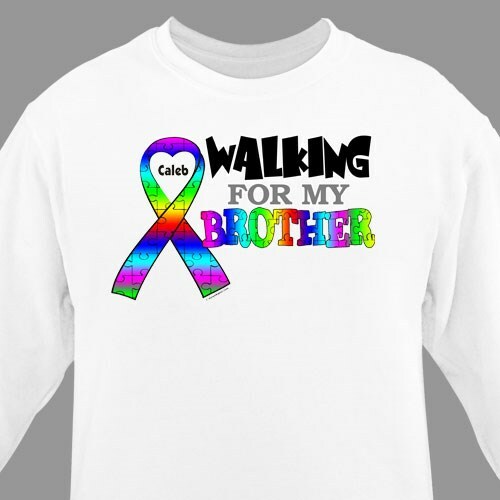 Our Personalized Walking for Autism Sweatshirt is great for any upcoming Autism Awareness Walk Event and shows that you too are there to support and help spread awareness. Today’s Price: $25.99 In Stock! NOTEVolume Discounted Price will appear in your cart as you add each item. Shirt sizes 2XL are an additional $3.00 each and 3XL or larger are an additional $4 each. See item drop down options for possible premiums. If you are ordering many of the same item simple enter your desired options, add to cart and repeat until complete. Additional Info We are dedicated to raising awareness of autism and the effects it has on families and individuals. Highlight the growing need for concern and awareness about autism with Personalized Autism Walk Gear from MyWalkGear.com. With our collection of Autism Awareness Walk Gear, you can show your support for anyone in your family struggling with this condition, whether you’re joining your community with upcoming Awareness Walk Events or just helping to raise awareness to anyone around you. Show your support everyday with our Personalized Autism Ribbon Dog Tag, our Personalized Autism Awareness Keychain and so much more when you browse through our collection of Personalized Autism Awareness Gear.